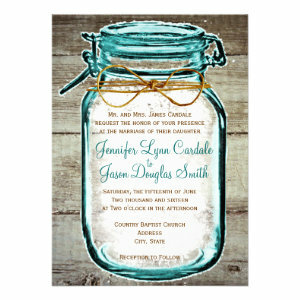 A selection of beautiful Mason Jar inspired wedding invitations. Great for country and rustic themed weddings. 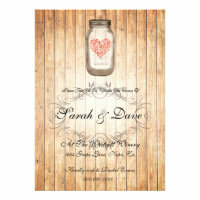 If you are planning on having a rustic wedding then these decorative mason jar invites are a great idea. 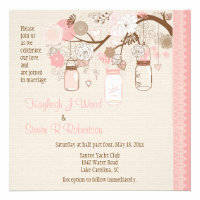 Featuring pretty spring flowers, love hearts, beautiful butterflies, and glowing fireflies. Perfect for giving your wedding a bit of natural charm. Ideal for lots of different wedding types from the traditional church wedding to more modern wedding styles, like country themed weddings, Summer garden party weddings, or a Boho beach wedding. A nice idea is to pick a colour theme to carry through your wedding celebrations. You could try matching the flowers of your bouquet to the flowers on your invite. All of the mason jar wedding announcements can be individually personalized, offering an extra special touch to your wedding guests. Easily change the text, font and colour to better match your theme. Need to order a lot of invites? No problem, just use the bulk ordering service for larger orders. With lots of different designs, styles and sizes to choose from, these Rustic mason jar wedding invitations are a lovely choice for your wedding celebrations.